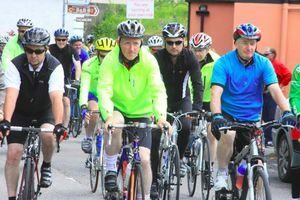 The Annual Cornamona 50 Mile Sponsored Cycle through the Hills of Connemara is held every year for different charities in the West of Ireland. Registration opens at 9 am and the official start time for the cycle is 10:30 am. Make sure you register and get your meal voucher for McHugh’s in Maam Cross and your T-shirt. Full route description with meal stops (and other suggested stops!) included on the map. The route is also marked on the road and signposted. Cornamona to Maam, Leenane, Letterfrack, through the Innagh Valley, Maam Cross, Maam then back to Cornamona. There will be stewards at important junctions! There will be help along the way with two maintenance vans with the cycle – just in case! Enjoy the day and don’t forget to look up from the road from time to time to enjoy the beautiful Connemara scenery!